Report submitted on 22 June, 2014 by Froilan Gomez. How can teachers find teaching jobs in Nueva Imperial, Chile? The School system is private, semi-private and state education, and you need a Chilean University degree to teach in any of the three system. However there are private institutes that hire native speakers with no degree. It is recommended to check with the Chilean ministry of Education to seek an employment opportunity. A degreed from any Chilean University. There are some British and American Universities that are registered where their degreed are accepted. A Master or Ph’d in English Education in ESL or EFL language. – 25,000 Chilean pesos per hour in college. For example: In a 40 hour month the salary would be 18,000X40 = 720,000 pesos. At the current rate of exchange this is approx. US$1,200. There is no work on holidays nor weekends. What advice would you give to someone considering coming to Nueva Imperial, Chile to teach English? What are the positive aspects of teaching English in Nueva Imperial, Chile? What are the negative aspects for teaching English in Nueva Imperial, Chile? To make people talk in English. The pronunciation of English is a big challenge. Are there any visa or other legal requirements to live in Chile? You have to seek an entry permit and a work permission upon entering the country, providing that you have an offer of a contract. What is the cost of living like in Chile? Rent: 1 room apartment 150,000 to 400,000 pesos in downtown Santiago. Rent: 1 house $300,000 to 2,000,000 pesos in downtown Santiago. There are Hotel and Hostels. Also you can deal person to person through personalised newspapers ads. There are also many rental agencies, however use discresion and choose those with ads in newspapers and speciality magazines. Motels are definitely NOT recommended. Other than teaching, what positive aspects are there for living in Nueva Imperial, Chile? The scenery and the people are very warm. Other than teaching, what negative aspects are there for living in Nueva Imperial, Chile? As with any other city in the world, beware of people who want what you have. What advice would you give to someone considering coming to Nueva Imperial, Chile to live? Don’t worry – be happy and enjoy. What do you think you will miss most when (or if) you leave Nueva Imperial, Chile? 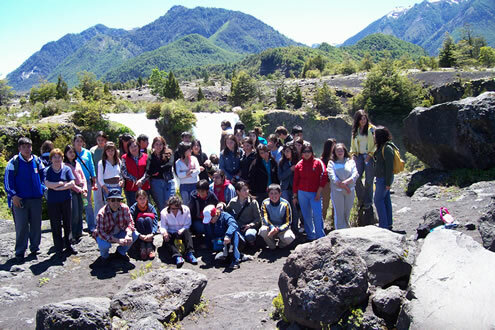 Where I teach: State school in Nueva Imperial (Araucania Region). I have been teaching in Nueva Imperial for 16 years. How I found my current job: Through an ad in the newspaper. I applied and was selected from 5 candidates. My school facilities: Adequate – Our school building is old with no heating. There is some technology like digital projectors in every classroom and a very slow internet connection. Text books are supplied by the ministry of education. Do you teach English in Chile? Tell us about your experiences – click here to submit your report about teaching English in Chile.